Soaring gracefully down to Earth from a balloon floating 101,000 feet high above Oregon, a NASA prototype of an airplane that someday may fly over Mars successfully completed a high-altitude flight test this week. Conducted at Oregon's Tillamook airport by the Kitty Hawk 3 project at NASA Ames Research Center, Moffett Field, CA, the test was designed to validate the aerodynamic performance of the prototype. Nicknamed "Orville" after one of the famed Wright brothers who first flew on Dec. 17, 1903, the NASA 731 glider was dropped from a helium-filled balloon that towed it up to an altitude of 101,000 feet - the highest ever for such a test - before releasing it. Engineers and scientists hailed the test as a great success. "It was a great flight and everything went really well. It appears that we realized all of our test objectives," exclaimed a jubilant Andy Gonzales, an Ames aerospace engineer who served as the flight test director. Low-altitude tests of NASA 729, another prototype called "Wilbur," were conducted last month at Ames. "Mars has always fascinated people," said Larry Lemke, an aerospace engineer at NASA Ames who serves as Ames' project manager for advanced Mars mobility concepts, which include airplanes as well as other systems. "Every time we send a mission up there, we come back with fascinating discoveries." According to Lemke, a Mars airplane is an idea whose time has come. "The Mars airplane is an idea that has been around for about 25 years, and over the past five years or so, it has been growing in popularity," he said. "I think a Mars airplane will play a role in exploring the Red Planet." Conventional in appearance, the Mars airplane concept developed by Ames engineers features a long, straight wing and twin tails in the rear. The remote-controlled glider tested in Oregon featured an approximately four-foot-long fuselage and an eight-foot wing span. "The flying we have successfully completed in Oregon is very similar to the flying that we will be doing over Mars during a productive exploration mission," Lemke said. "One unique aspect of flying a Mars mission with an airplane is that it must be constructed in a fold-up configuration in order to fit inside a spacecraft." In its future configuration for Mars, the aircraft is expected to have its own propeller propulsion system capable of operating in the Mars atmosphere, which is comprised mostly of carbon dioxide. It will also carry a variety of sophisticated instruments to observe and conduct science experiments. "The possibility of life on Mars is a very hot topic and an interesting question, so I'm sure you will find instruments on board that are designed to find signs of water on Mars, which is necessary for life," Lemke said. "In addition, we would have a large array of cameras on the airplane to be able to see large areas of the Mars terrain in very high resolution," Lemke said. He said the cameras aboard the aircraft would be so precise, they could see objects on Mars as small as the size of a quarter. "I think the images will be stunning," he said. "During a Mars airplane mission, we will be able to view the planet at very close proximity and this will convey to the public that there is a real planet there, not just an abstract." "Our test flight at Tillamook airport showed the airplane's flight was very smooth and stable which makes for a good platform for science instruments," said Gonzales. Ames engineers predict the next few years will be challenging, as they prepare for a potential mission to Mars. 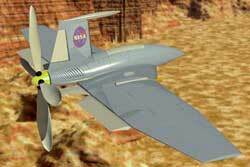 "We will be expanding the envelope and developing a much more complex aircraft for exploring Mars," Lemke said. The next step will be to develop a Mars airplane model with folding wings and later, one with a propeller propulsion system. Computer animation of the proposed Mars airplane arriving at the Red Planet and taking flight. Spaceflight Now Plus enhances our extensive coverage with additional video, audio, image and virtual reality for a low-cost monthly or annual subscription fee. Click here to see other available clips.